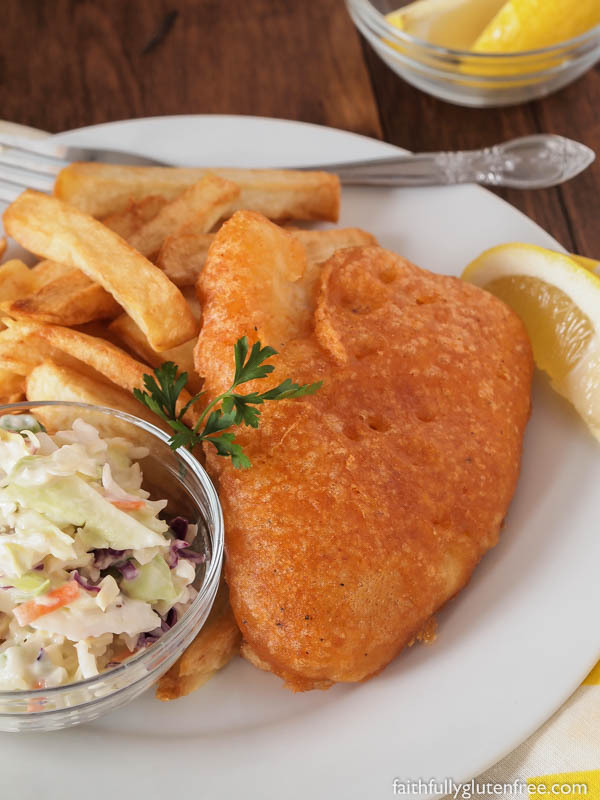 You won’t believe how easy it is to make your own Gluten Free Beer Battered Fish at home. Add a side of hot fries and some creamy coleslaw, and you’ve got the perfect pub dinner. In the 10 years since my celiac disease diagnosis, I have only come across the occasion for gluten free fried fish while eating out twice. You may think – good, fried food is bad for you. True, I won’t argue with you there. But fried food is something that I think people that can still eat gluten don’t really think about. 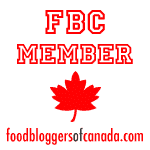 Even finding a restaurant that has a safe deep fryer for french fries can be a challenge. So finding a place that has gluten free Beer Battered Fish or Onion Rings is nearly impossible. This Beer Battered Fish dish actually comes together quite quickly. Quick enough that it can be prepared on a weeknight. If you have time to bake some french fries, you have enough time to fry up some fish. The fish actually takes less time to cook than the french fries. I’ve made this with both tilapia and cod fish, and my family definitely prefers the cod. It has less of a ‘fishy’ flavour, which no one here really likes. 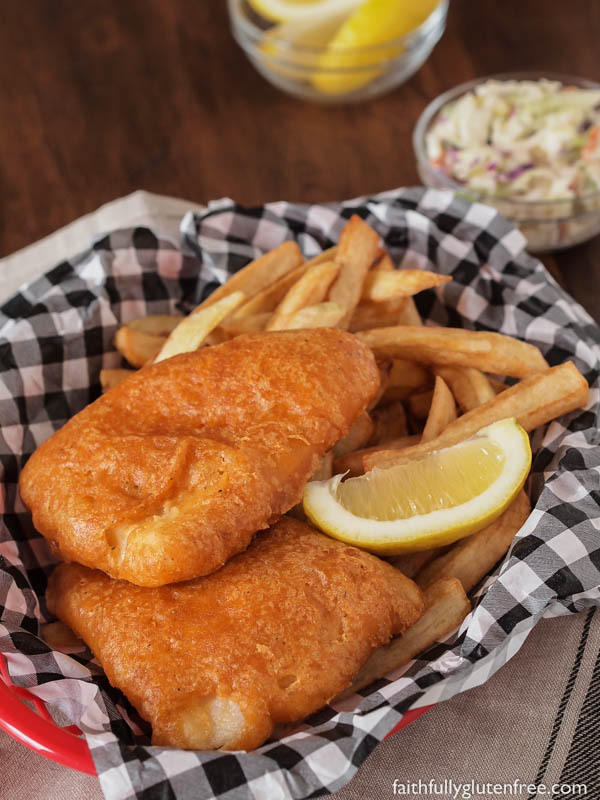 You won't believe how easy it is to make your own Gluten Free Beer Battered Fish at home. Add a side of hot fries and some creamy coleslaw, and you've got the perfect pub dinner. Heat oil in a heavy bottom pot or a deep fryer until 365 degrees F.
Rinse the fish and pat it dry. Place 1/2 cup brown rice flour in one bowl. Set aside. In a separate bowl, whisk together the batter ingredients. The batter will be fairly thin, that's alright, it will work just fine. Working one at a time, dip the fish fillets into the rice flour, then into the batter, and then carefully place it in the hot oil. You shouldn't overcrowd your pot - only fry a few pieces of fish at time. Fry fish, turning once, until both sides are a golden brown (about 2 minutes per side). Drain on a paper towel lined baking sheet, and serve while still warm. 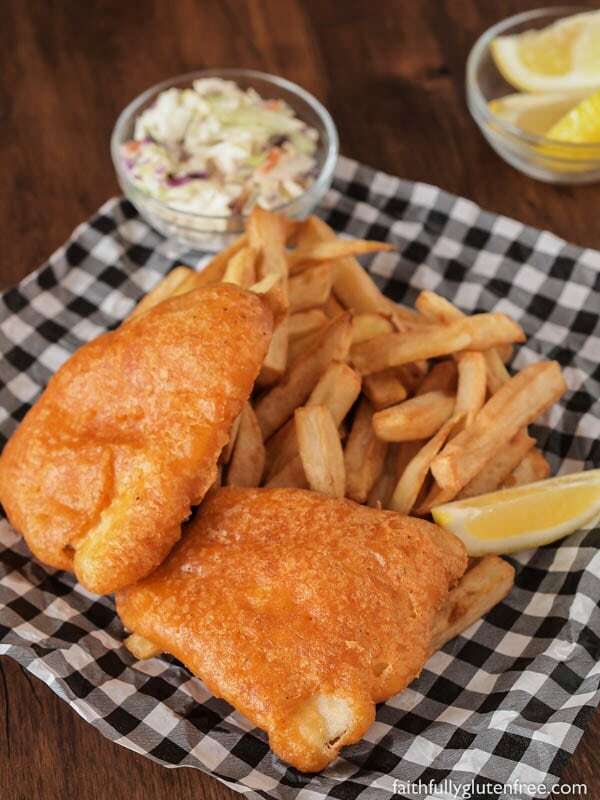 Don’t discard the oil after frying this gluten free Beer Battered Fish. 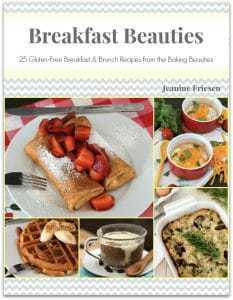 This recipe and images were updated in February 2018. Wow, that looks amazing! You are adventurous in the kitchen, and thank goodness for the rest of us! You are awesome!! I hope I can find some GF beer and try this sometime soon!! Well now I want some beer battered fish! That looks fantastic. Thank you so much for sharing your talents! It looks like you have attained perfection here! Yum. The markets near me don't have a good selection of GF beer, but I will have to keep looking. Thanks for posting another great recipe. could I make this using chia seeds or flax instead of the egg? or enrg egg replacer.This was always my favorite treat and I really miss it.Thanks. this was delicious! We made this with friends and actually just used seltzer water (since none of us drink and gf beer is hard to find here) it was great!!! Definitely a once-a-year awesome treat!! This recipe is DELICIOUS!! I will never make it a different way. We used club soda instead of buying GF beer, and it works just fine 🙂 THANK YOU! 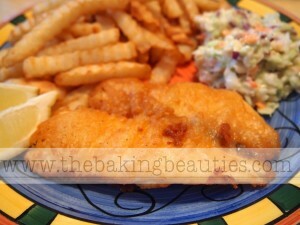 Omg i used to love getting beer battered fish at mimis cafe….ive missed it this goes on this weeks menu for sure!!! Do you have a recipee for the slaw? I hope you enjoy it, Alicia! Made this for dinner tonight and it was wonderful. GF beer is still unheard of here and I didn’t have club soda or 7-up both of which I’m sure would work. I just substituted plain old water and it was great…..just a nice thin crispy coating which was especially delicious with the garlic powder and paprika….Going to be a regular her! Thanks Janine! We made this last night and it was delicious. Our 8 and 10 year old gobbled it up. We used 7-up instead of gf beer and it turned out great. Thank you for sharing. We are so glad we found your website. Yeah!! I’m so glad that you found it too! 🙂 I haven’t made this in a while, may need to change that. 🙂 Thanks for popping in, MK! Though I haven’t tried it in our own kitchen yet, we dined in a GF restaurant in Colorado Springs called Coquette’s and they made fabulous GF fish and chips. Instead of beer, they used Strong Bow Cider which is easier to find in a liquor store than GF beer. If that brand is unavailable, try one of the European tasting ciders which are more tart than many of the New England brands. Made this last night with fish and shrimp, it was the BEST! My husband who only eats GF for me (celiac), could not get enough! I’ve tried other beer batter before, this is #1, thanks a bunch for sharing. Oh forgot, Redbridge is easy to find in grocery strores here in Florida and it works great for the beer part of this. THANK YOU SO MUCH FOR THIS RECIPE!!! Just recently diagnosed with Celiac and I was worried I would never be able to have another beer battered fish, especially during LENT. This recipe was wonderful. I used Bob’s Red Mill 1 for 1 Gluten free flour mix and Redbridge Gluten free beer. AMAZING flavor. I’ve made this about 4 times, with halibut I have in the freezer. It turns out perfect every time. A good gluten free beer I have recently found is called “ground breaker”, with a tractor on the label. Made it today. What a treat for my wife, who has had to be gf for 10 years now. Hard cider worked nicely. Can Bobs Red Mill GF 1 to 1 flour be used is place of the other flours? And I am having trouble finding GF beer. Any suggestions would be appreciated. The recipe now suggests club soda as an alternative to beer, and others have used 7-Up successfully. If you’re really trying to get some of the hop flavor from beer, you might want to try an internet search for things like “beer without hops” or “hop substitutes”. An Earl Grey tea bag in some club soda might do the trick. You may have to experiment a bit.